The Devils added one forward as they signed Damien Brunner but also trimmed their roster down to 28 players this week. Brunner joined New Jersey for a pro tryout on September 16th, and tallied two assists in the team’s 3-0 win over the New York Islanders at the Barclays Center. 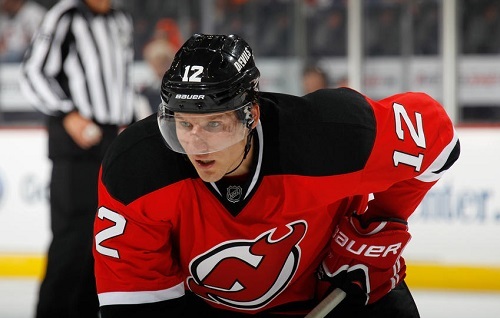 “I’m really excited about being a Devil and sticking around,” Brunner said. Brunner played for EV Zug in Switzerland last season, and was named Forward of the Year as well as a member of the Swiss national League A All-Star Team. He led the league in assists (36), points (60), and points in the playoffs (14). Damien Brunner #12 of the New Jersey Devils skates against the New York Islanders at the Prudential Center on September 19, 2013 in Newark, New Jersey. While it’s excited to add a proven scorer (albeit in a different league) the Devils are still figuring out who fits where as they head into their final preseason game Thursday against the visiting Philadelphia Flyers. There aren’t really any surprises, necessarily – most notably Eric Gelinas and Jon Merrill were sent down to the Albany Devils (AHL), although they “impressed” Lamoriello – but that’s what makes the upcoming week-ish difficult. The roster has to get down to 23 players by Monday’s 3 p.m. deadline so five will have to. Let’s be real, the Devils traded for goaltender Cory Schneider for a reason; they won’t keep Keith Kinkaid on the roster, so that’s one spot. There are 17 forwards and eight defensemen left, then, and four more will have to be moved (yay simple math). My guess is that Lamoriello will trim back just one D-man in Alexander Urbom, but that means finding three forwards to cut from the roster and that seems like a lot. Looking at the list of players, there are five guys who are new to the team in Brunner, Ryane Clowe, Rostislav Olesz, Michael Ryder, Jaromir Jagr, but that obviously doesn’t necessitate a roster sport; of them, I’d guess that Olesz is on the shortlist. Veteran Devils forwards include Krys Barch, Steve Bernier, Ryan Carter, Patrik Elias, Stephen Gionta, Adam Henrique, Cam Janssen, Jacob Josefson, Andrei Loktionov, Mattias Tedenby, Travis Zajac, and Dainius Zubrus. I’d imagine that Lamoriello would keep only one of Barch and Janssen given their roles, and Tedenby hasn’t played since the first preseason game on September 16th, although he skated today. The Devils still have that last preseason game to play before Monday, though, so it’ll be interesting to see if there’s a final push for spots before the axe decisions are made.